Keisha was wondering whether to have a sleep study. “I asked my doctor to give me something for my insomnia,” she wrote, “but he wants me to have a sleep study first. He thinks I might have sleep apnea. I don’t think I do. I don’t snore (as far as I know). I wake up a lot at night but I’m not short of breath or gasping for air. 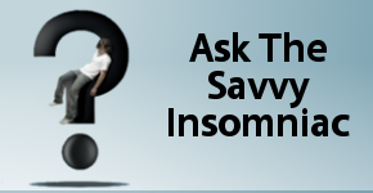 Keisha, a 37-year-old graphic designer, wrote to Ask The Savvy Insomniac recently with a question about having a sleep study. I asked my doctor to give me something for my insomnia, she wrote, but he wants me to have a sleep study first. He thinks I might have sleep apnea. I don’t think I do. I don’t snore (as far as I know). I wake up a lot at night but I’m not short of breath or gasping for air. Besides, how could I get any sleep at all with those wires attached to my head! You say sleep studies aren’t helpful for people with insomnia. So what’s your opinion here? Should I have a sleep study or will it just be a waste of my time? When Is a Sleep Study Useful? Keisha is right: I’ve blogged about sleep studies before because I’m skeptical about their value for people with simple insomnia. As conducted and scored today, they do very little to help insomniacs other than rule sleep apnea and other sleep disorders out. But if a doctor suspects you have sleep apnea, it’s important to verify that objectively. A sleep study is then in order, at a sleep clinic or with one of the newer devices for use at home. Obstructive sleep apnea (OSA) is a serious problem. During sleep, the tongue falls back against the throat, collapsing the upper airway. This keeps you from breathing, deprives you of oxygen, and increases your level of carbon dioxide until you wake up enough to start breathing again. OSA compromises the sleep you get, leaving you sleepy and prone to mistakes and accidents. It also leads to serious health problems. Repeated episodes of apnea stress the heart, increasing your susceptibility to hypertension, heart attacks, and other cardiovascular diseases. It’s also associated with weight gain, type 2 diabetes, inflammation, asthma, and acid reflux. In short, it’s nothing to fool around with. Of 1210 insomnia patients presenting at a sleep clinic in Albuquerque, New Mexico over a period of 8 years, about three-quarters (899) were using sleep aids regularly or occasionally. The majority of these—710—were using prescription sleeping pills. The rest were using over-the-counter sleep aids. None of the 899 medication users reported improved sleep. So they, as well as the others, whose sleep had failed to improve following drug-free insomnia treatments, were seeking further assistance. All of the patients were verbally screened for OSA. Then 942 underwent sleep studies. About 91 percent tested positive for moderate to severe OSA. Yet a screening tool used by many primary care physicians to ascertain the likelihood of sleep-disordered breathing failed to detect it in 32 percent. What’s more, the patients taking prescription sleeping pills were least likely to report symptoms of apnea and the most likely to report severe insomnia and other health problems. In other words, it’s easy to mistake OSA for insomnia, and primary care physicians may do the same. You’re then treated for insomnia when you should be treated for apnea, compromising your quality of life and increasing your vulnerability to heart and other serious health problems down the line. Occasionally I hear from people like Keisha who doubt that a sleep study could tell them anything they don’t already know. There’s a chance they could be right. On the other hand, this is one instance when what you don’t know could end up hurting you a lot. And now, with much less expensive home testing devices available, there’s less reason for concern about cost. If your insomnia takes the form of waking up several times at night and if, after being interviewed by your doctor, he or she suspects you might have OSA, bite the bullet and have the test. Insomnia is no picnic, but untreated apnea is worse. Most primary care providers use an NOS (non-invasive Nocturnal Oxygen Saturation test) as a quick screen. They are a reasonable first level screen, and probably I think will be approved by Medicare eventually to diagnose severe OSA. The more mild OSA patients do have a lot of sleep hygiene issues and insomnia-type complaints, and as the research (Dr. Krakow?) you referenced showed, most of the complaints resolve with OSA treatment (CPAP, oral device, etc.). The Berlin questionnaire is a good screening tool to use as well. Thanks so much for adding to the story. My reference is to the abstract of Krakow’s paper: http://www.mayoclinicproceedings.org/article/S0025-6196%2814%2900473-X/abstract. I have to have a sleep study done, but I don’t snore but I do wake up every hour at night. I’m very tired all day every day but I don’t doze off all day long when I’m sitting down doing nothing but that cause I have a 2 year old. I don’t take sleeping medication because I’m afraid if I do I won’t here my daughter if she wakes up. I have always just thought it was insomnia. Could it be possible I have sleep apnea if I don’t snor and I don’t know if I would doze off thru out the day cause I don’t go to sleep when my daughter in awake? Also when it’s nap time for my daughter I always take a nap with her because I know that’s when I feel I get the best sleep? If you find that you’re sleepy during the daytime and you’re waking up often at night, it’s a good idea to go in for a sleep study. Those symptoms would suggest that you might have sleep apnea, and at the sleep lab they’ll be able to tell you whether you do. Snoring, too, is a symptom of sleep apnea–but I’m not sure people with apnea always snore (or that they’re always aware that they snore). Anyway, it’ll be good to have your sleep checked out. You might find out that you don’t have sleep apnea and that your problem is insomnia. In that case, the treatment would be very different. 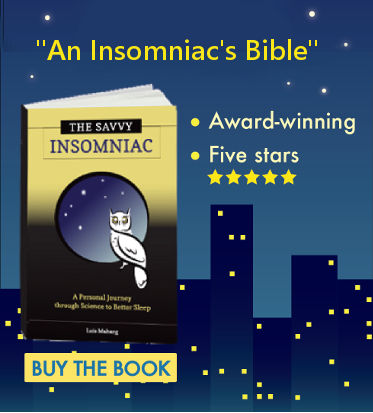 I’ve written about many insomnia treatments on this blog. If you take a look at the topic cloud (to the right) you’ll find them there. I have experience that makes me believe that the diagnosis of apnea and the prescription of the sleep study and C-PAP is, in part, a money-making racket. If a patient has ANY low-oxygen episodes in a night, might that be sufficient to justify the expense, even if there are other more likely causes of sleeplessness? My situation deteriorated badly under a doctor’s care, because he ignored my pleas that anxiety was the problem, not apnea. I’m sorry to hear about your doctor misdiagnosing your problem and the deterioration of your health as a result. I’ve heard, in the past, that some unscrupulous physicians DID use the diagnosis of sleep apnea as an excuse to order sleep studies that were unnecessary, and profited as a result. If your sleep problem involves nighttime wake-ups, this would suggest that the doctor was right to be concerned about sleep apnea. Anxiety tends to be more associated with problems getting to sleep at the beginning of the night. Depression is often associated with waking up too early in the morning. I hope the physician you’re seeing now is more in the know about sleep and sleep disorders and more honest in his dealings with you. Lois, I don’t think the doctor was unscrupulous nor lacking knowledge about sleep disorders. In fact, he is the lead at a major hospital’s sleep disorders clinic. It is the hammer issue. If all you have is a hammer, every problem looks like a nail. He is specialized to treat apnea, and cannot handle anything else except with prescription meds. It sounds like your experience says this is uncommon. I think I need to find a patient advocate. Three psychiatrists in a row have let me down. I do know about the hammer problem. In fact, a well-known sleep specialist delivered a talk at a sleep conference I went to some years ago, and the title of his talk was this: “When you’ve got a hammer, everything looks like a nail.” He was talking about insomnia, though—not sleep apnea. And he was cautioning the audience about diagnosing every patient complaining of a sleep problem with insomnia, when on closer inspection they might find that something else was going on. I don’t know how common the hammer problem is. I haven’t consulted with psychiatrists. As a patient, I haven’t consulted many sleep specialists, either—although I interviewed several for my book. My impression of the ones I interviewed was that they would be very careful, conscientious diagnosticians, and would not see every patient having the same problem or treat every patient the same way. That was refreshing to see. My quarrel has always been with general practitioners. Most of the ones I’ve consulted haven’t known much about insomnia at all. I don’t know how you would go about finding a patient advocate. If you figure it out, let us know!